On the final leg of his five-nation tour, Prime Minister Narendra Modi arrived in Mexico City on 8 June. Upon his arrival, PM Modi was greeted with chants of 'Bharat Mata ki Jai' by the Indian community in Mexico city. He was received by Mexican Foreign Minister Claudia Ruiz-Massieu Salinas. PM Modi issued a joint statement with Mexican President Enrique Peña Nieto. Following delegation-level talks between the leaders, PM Modi thanked Mexico for its positive and constructive support for India's membership in the Nuclear Suppliers Group (NSG). "Mexico was the first Latin American country to recognise India. I and President Enrique Peña Nieto are meeting for the third time in last two years. Since then the trajectory of our bilateral ties have shown growing intensity," Prime Minister Modi said while issuing a joint statement along with the Mexican President. 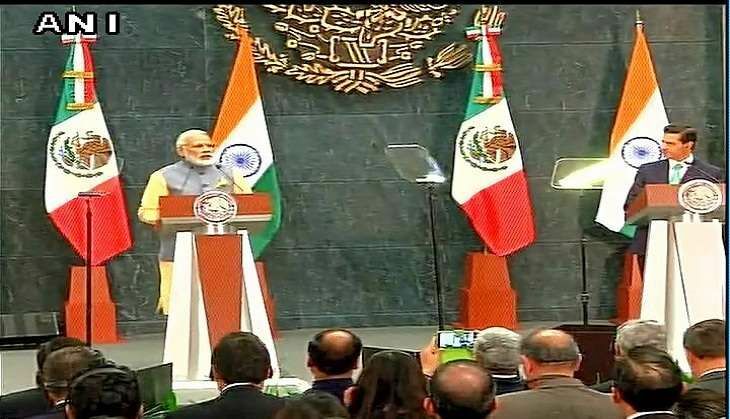 While asserting that India and Mexico are now looking to move beyond their buyer-seller relationship, PM Modi said both the nations have agreed to find ways to deepen cooperation in space, and science and technology. "Information technology, energy, pharmaceuticals, and automotive industries are among key growth areas of our commercial linkages. But, there is potential to expand our commercial and investment, and science and technology partnerships in new areas. In this regard, the President and I agreed to find ways to deepen our cooperation in space, and science and technology," he said. "We will also prioritise concrete projects in areas of agricultural research; bio-technology; waste management; disaster warning and management, and solar energy. Mexico is an important partner for India's energy security," he added. PM Modi also thanked the Mexican President for his support to the International Solar Alliance. "I thank President Enrique Peña Nieto for his positive and constructive support for India's membership in the NSG," he said. Earlier, US President Barack Obama had also said that his country is backing India's bid to join the club.